I am a super bad mom, I really am. Once the [tag]caffeine[/tag] hit the system this morning I jumped up and baked these [tag]cookie[/tag]s (the dough was in the fridge overnight). The bad part is that we essentially had these for breakfast. We are going to have a second course of [tag]egg[/tag]s and toast but the brutal honest truth is that we had [tag]chocolate[/tag] cookies for [tag]breakfast[/tag]. Man, they are good though, especially right out of the oven. I adapted a recipe by N. Hoff from the AllRecipes.com “Tried and True Cookies” cookbook (page 80) . 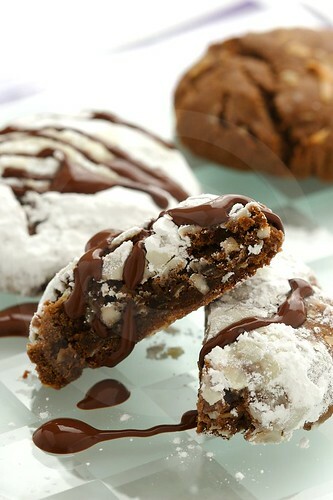 It is very different from the original recipe, which didn’t have chocolate or powdered sugar or chocolate sauce. The reason I refer to mine as hedgie cookies is because the coconut makes them a bit prickly like hedgehogs and because I think hedgies are just the cutest little things. Add egg, vanilla, and chocolate powder and mix well. It will be getting thick now. Add the flour by 1/3rds. The mix will be very thick, like a dough towards the end. Don’t be shy, use your hands to knead it all together. Add the coconut flakes. You will likely need to use your hands to incorporate the coconut. Chill in the fridge (I did it over night). 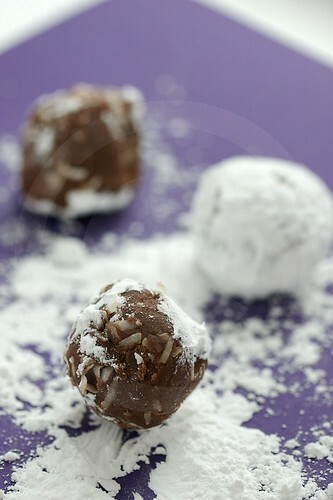 You can dredge in [tag]powdered sugar[/tag] or more [tag]coconut[/tag] before baking. 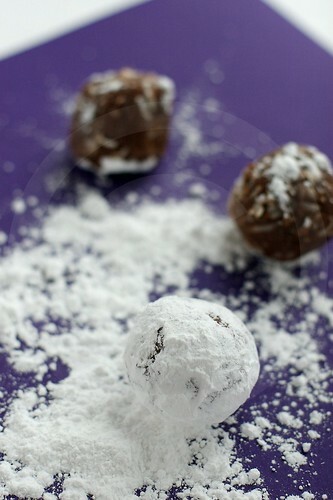 Dust with powdered sugar and [tag]chocolate sauce[/tag]! Mix [tag]chocolate powder[/tag], [tag]sugar[/tag], [tag]vanilla[/tag], and [tag]Kahlua[/tag]. Add boiling water a few teaspoons at a time, slowly. Add enough boiling water to make it the consistency you like. 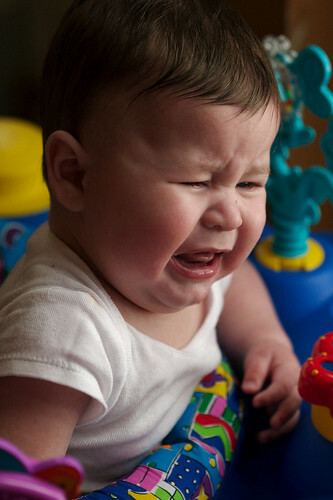 Here is a shot of Baby Oh who is 1) upset about not getting any cookies, 2) upset that mommy has pulled out the food photography stuff, and 3) upset that he is in that infernal bouncer. ← Liver and Onions: You might even like it! Bill – you are an extremely practical person! My kind of guy. Would you like a cookie? Nika, I intend to bake these beauties on the weekend. The chocolate powder you mention, is it the one to make hot chocolate with or is it cocoa powder? Thank you very much! Patricia: let me know how they turn out for you! I was referring to the cocoa powder like hershey’s cocoa which i just use as an ingredient most of the time. I may be a bit late to the game, but THANK YOU for this recipe! I first made them a few months ago when I was having a coconut craving – since then they’re my standby cookie for friends or late night snacking! I am just wondering how many cookies this recipes makes?